This morning I fully assembled my shade structure for the first time. Last weekend, I’d put up the center pole and support ropes, but today I collected all my gear and timed my assembly time. In total, it took me about 1 hour to assemble all by myself. I’m pleased with the result so far, but I’ll reserve final judgment until it’s been playa tested. 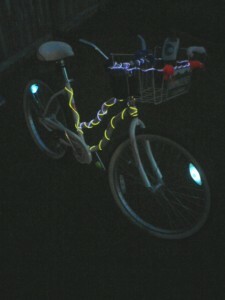 Also, I received my El Wire and outfitted my bike today as well! Previous Previous post: Love More. Fear Less.